This morning's satellite picture (below) shows an impressive frontal system moving onto coast. 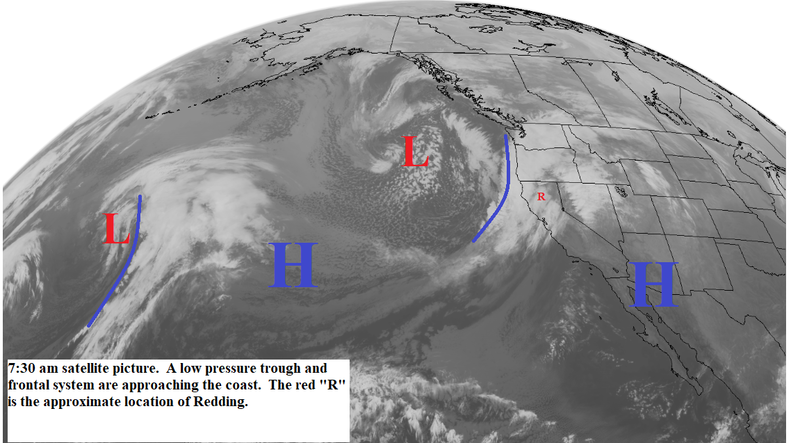 This system will bring moderate to locally heavy precipitation to Northern California today along with gusty south winds. Snow levels will be 3500 to 4500 feet. The rain will taper off this evening as the front moves east. Thursday the upper level low pressure trough will be over our area. This system will bring scattered showers to the north state with snow levels 1500 to 2500 feet north and a little higher south. The showers will end Friday morning. Saturday high pressure begins to build northward over California (see map below). This will push the jetstream or storm track northward. Saturday through Monday we will have partly cloudy to cloudy skies. Saturday and Monday frontal system will pass by to north. These systems will bring light showers to the north coast, coastal and northern mountains and the Sierra Cascades north of Plumas county. There could be a light sprinkle in the valley north of Red Bluff. Snow levels will be around 5000 feet. Tuesday through the end of next week the high pressure area will be along the coast and we will have mostly clear skies with above normal temperatures.